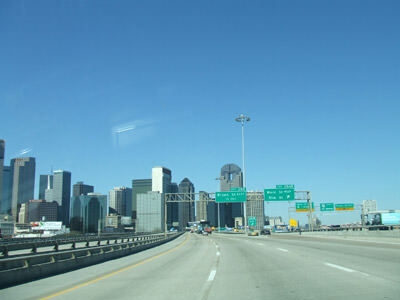 As I passed through Dallas again, I could see the tall buildings of the city. It is a magnificent metropolis. It exudes the strength of our country. I tightened my seat belt and was swallowed by the vortex of steel and concrete the Texas Aggies call a freeway system. I popped out the other side safe and sound. I set my Tom-Tom GPS for Fairview Texas. The lady in the GPS-Box laughed and asked, “Which Fairview, Texas?” Texas is so big it has multiple cities with the same name. I managed to find the right Fairview, Texas. It is located on the northern end of the swelling growth extending out from Dallas. Everything is new, the malls, the gas stations, and the homes. They are even building a new fire station. 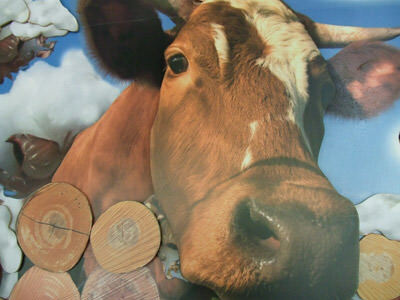 In the mix of new construction are grazing cows, horse farms, and coyotes enjoying the dogs and cats that have been added to their food supply. I got to Joyce Foy Spizer’s place and was met at the door by a beautiful lady, and a pretty secretary with a little barking dog named Allie. I had met Joyce last year at a writer’s conference and she invited me to stop by when I came to Texas. She is an incredible person. She is a writer, teacher, movie producer, ex private investigator, and mentor to many actors and writers involved in the movie and TV industry. 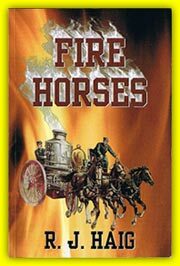 I am presently trying to adapt my book, “Fire Horses” to a screen play format. Joyce and I sat on her couch and she gave me instruction on what I had to do. I learned more at Joyce’s house than I have during the last six months reading books. She is a great teacher and our afternoon was filled with laughs and stories about our journey through life. Joyce is interested in many things including sports. She wrote a book about her friend Tony Hill of the Dallas Cowboys. She also has a book out about her close friend Howard Keel. Howard was a famous movie star who lost his life to cancer. Joyce and Howard’s widow remain close friends. It was an incredible day for me and the ending was the best of all. We went out for dinner at a wonderful Mexican restaurant. Before I knew it, it was 10 PM. Joyce gave me a warm hug and we said goodbye. My day with Joyce Foy Spizer now sits at the front door of my memory bank. It doesn’t get better than that. Go to www.joycespizerfoy.com . You will find pictures of Joyce and information about the many things that she is involved with. Also check out www.incahootspublishing.com. 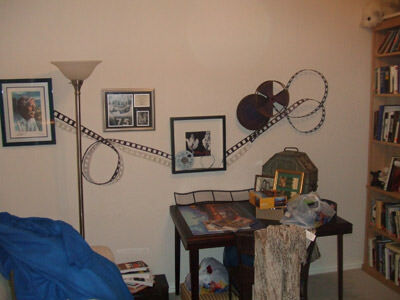 Joyce's room reflects her passion for movies. 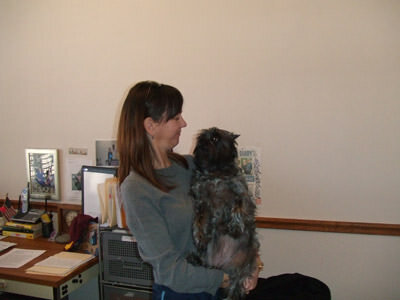 Allie helps her master at work.